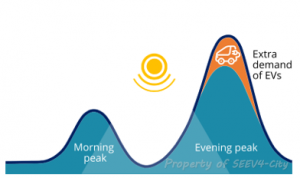 Charging electric vehicles in the evening creates a peak demand when renewable electricity production is lower. Expensive grid reinforcement is required to limit peak demand. Information and Communication Technologies can help to structure and maximize the synergies between electric vehicles and local renewable energy sources, thereby optimizing the electricity grid. 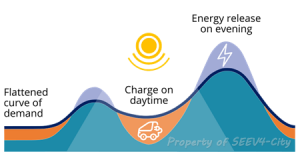 The electricity grid is used as energy buffer, on a daily and a seasonal scale. Large amounts of local energy and EVs cause grid-stress. SEEV4-City aims to provide sustainable solutions.